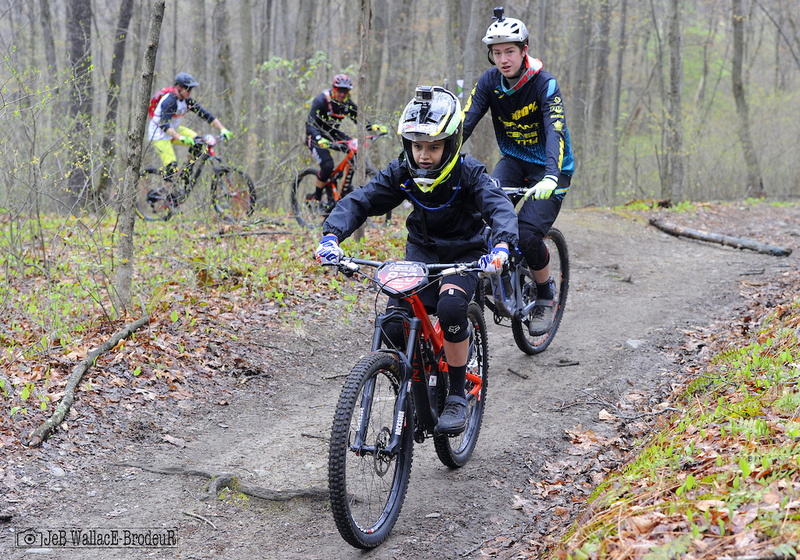 After what seemed like an eternal off-season, racing returned to the Northeast with a bang this past weekend as the Vittoria Eastern States Cup Enduro series charged out of the gate in Pennsylvania. Veteran pro Jason Scheiding was the first man on course, and with that the six-month Vittoria ESC race season officially began. 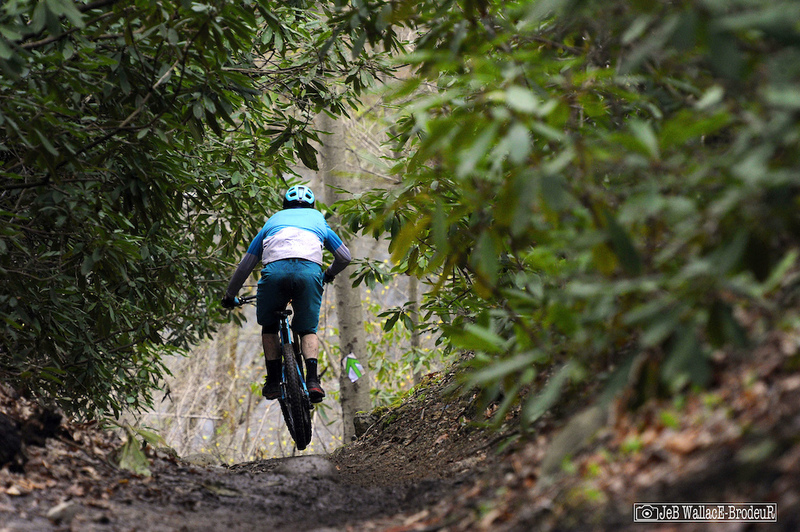 The leaves were just starting to bud out on the trees and the Wake Robins were in bloom as more than 200 racers shook the cobwebs off and battled for bragging rights at Glen Park, a new venue for the series. 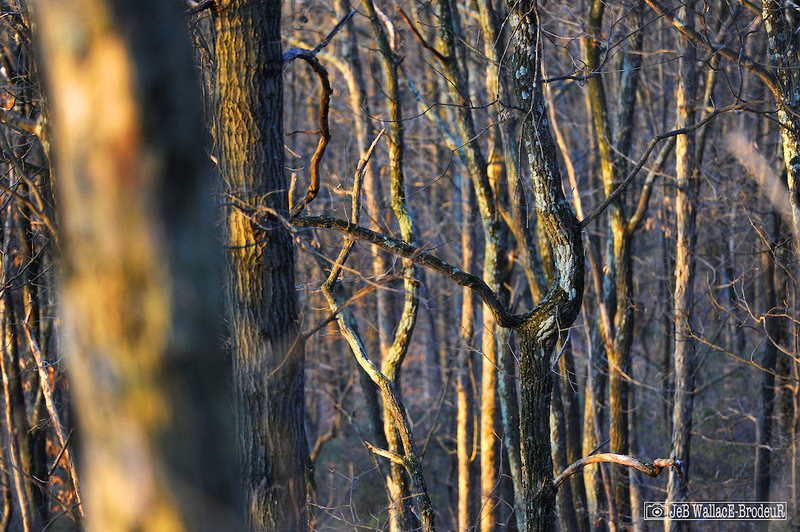 Glen Park is located in Stroudsburg, Pennsylvania in the heart of the Poconos. It has been ridden for years by locals and is considered one of the original freeride/downhill spots on the East Coast with many features dating back to the 90's. 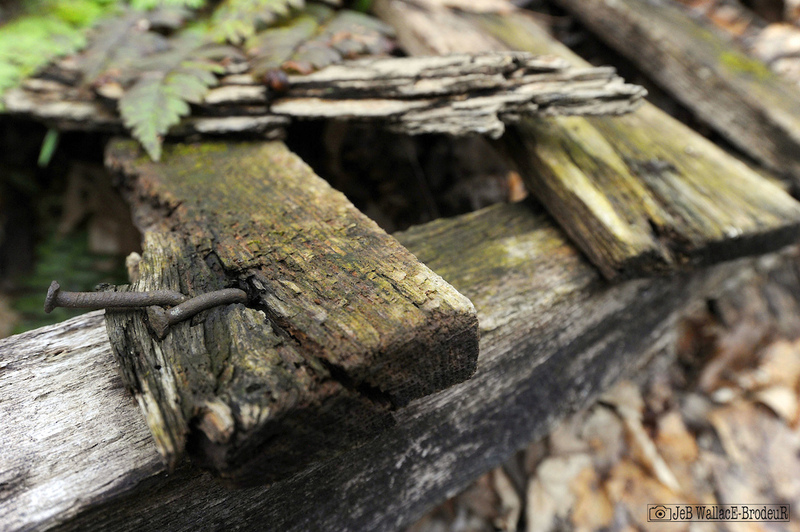 A testament to that history can be seen in the abandoned ladder bridges and sketchy doubles and drops that are sprinkled across the park's modest vertical. 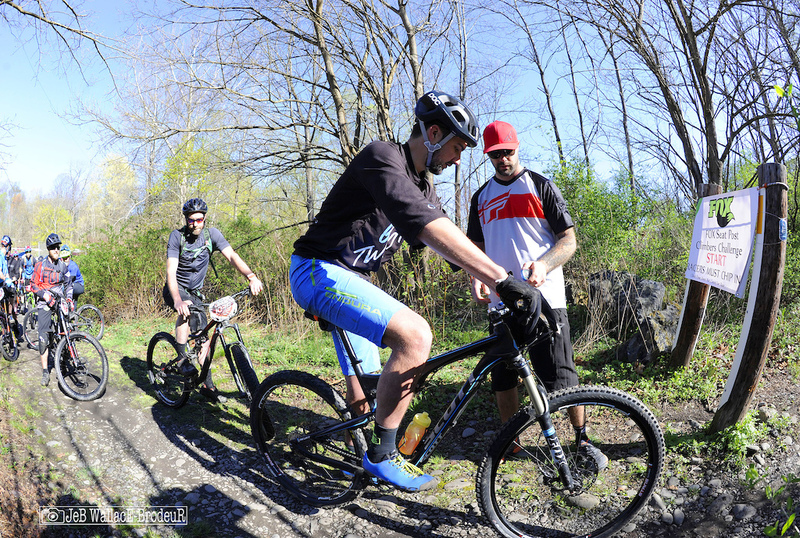 The Pocono Bike Club has been holding enduros at the park of late and an active group of locals has been maintaining the trails and a labyrinth of jump lines in an area called The Maze just off the parking lot. Eastern States Cup North American Downhill Team member Aidan Casner sampled the freeride options in The Maze before racing to a second-place in the 18-and-under class. 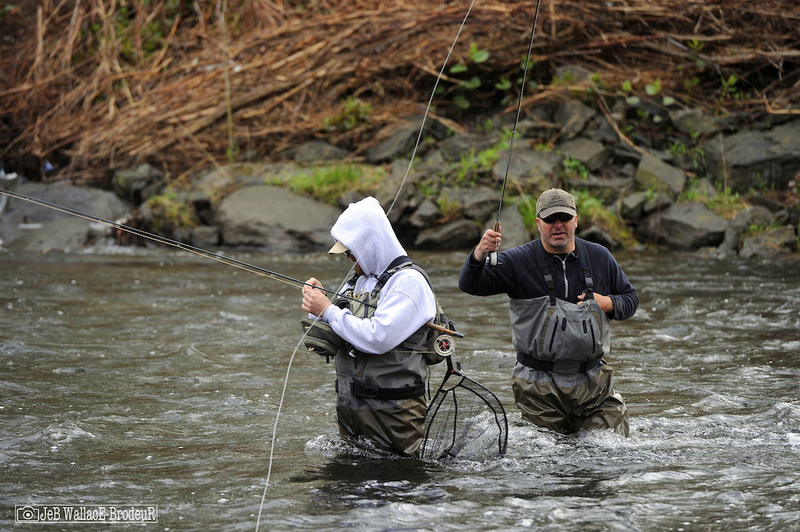 The mountain sits above Brodhead Creek, a popular fishing destination, and attracts a wide array of user groups from dog walkers and birders to off-road enthusiasts. The park is an urban wilderness with ducks and bald eagles co-existing with folks in "temporary housing" arrangements. Much of the mountain is covered in dense thickets of rhododendron. 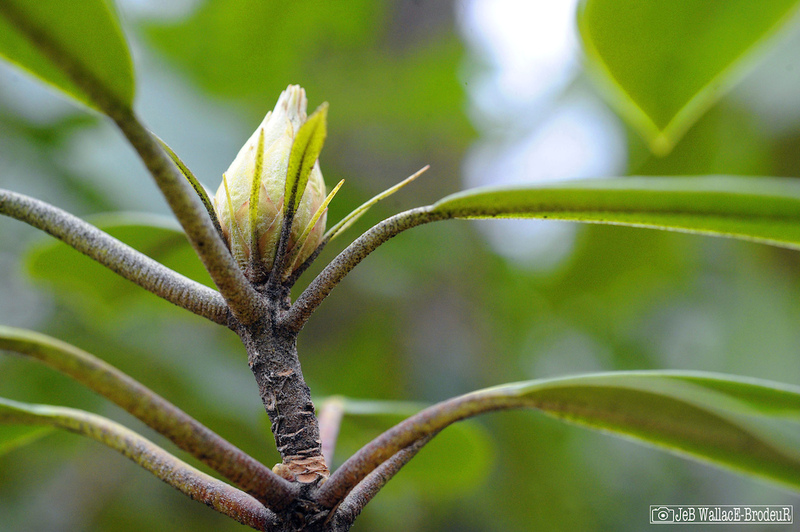 It was too early for the shrubs to be blooming but it promises to be a riot of color when the buds open in a few weeks. This enduro is one of only two on the Vittoria ESC calendar with no lift assist transfers. The climb followed a mix of single track and woods roads and was just stout enough that many racers were walking by their fourth or fifth lap. The Defiant Racing team, led by Clif Kids 14-and-under champion Michael Maldonado, stayed in the saddle for their practice laps. Maldonado's win was the first enduro win for the speedy youngster who is already a seasoned veteran with 52 race starts under his belt. Let's take a look at the tracks: Stage One began at Glen Park's highest point. After a high-speed low-angle charge down the mountain's shoulder racers faced a succession of rocky obstacles. 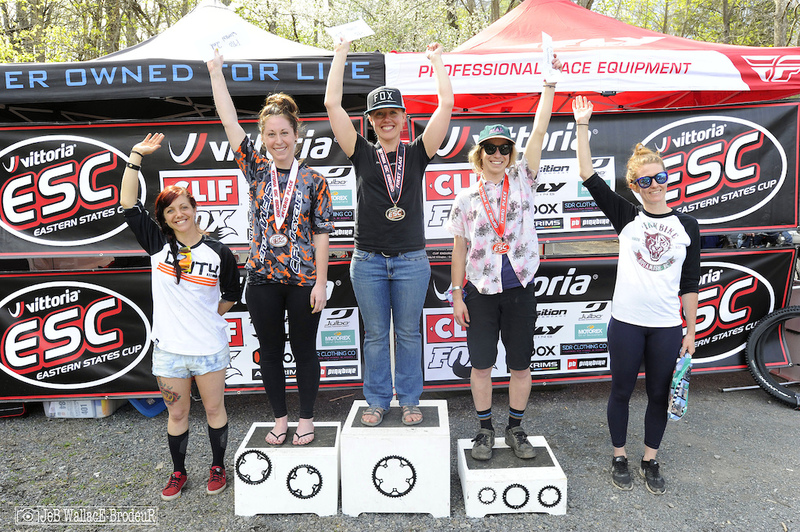 Vermont pro Clair Sick, riding for Deity, I RIDE and Schwalbe, finished in fourth and sent the biggest rock on the stage directly into a poppy double. The middle of the stage featured fast traverses connected by tricky flat corners, a theme for the day. Jim Catalano from Team Overlook got his first career Vittoria ESC start in the 50+ class. 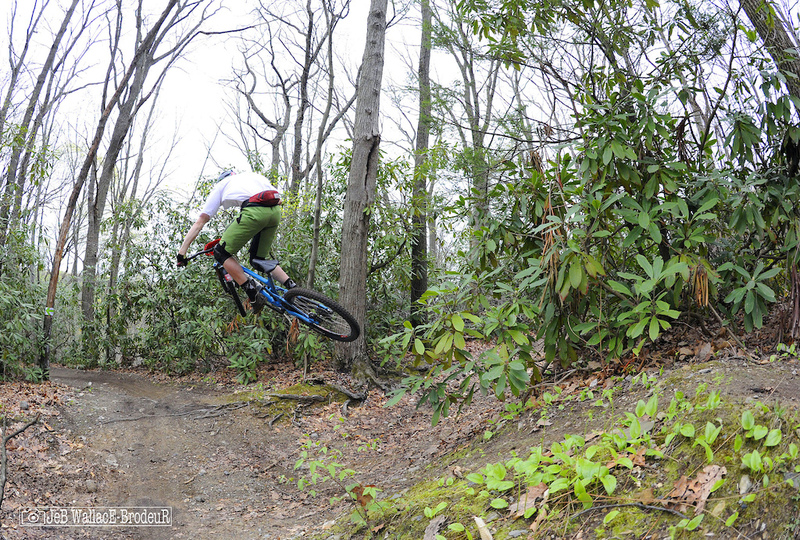 The bottom of the segment wound through a jungle of rhododendron before dropping steeply down a peanut butter slick chute to the finish. John Nicholson from Team Jersey Home Grown, always one of the fastest guys on the hill, raced to a fourth-place finish in the highly-competitive 40-49 class. A lower shoulder of the mountain was used as the start of the next three stages which all began within spitting distance of each other. Stage Two started with a twisty romp through the woods before dropping into a broad gully that featured a launch pad exit. 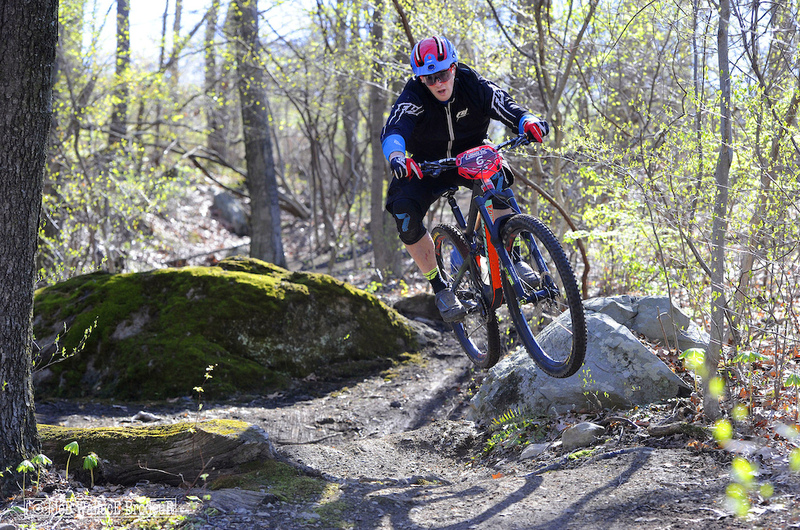 Rhode Island speedster Max Beaupre, racing for Trek, Deity and NBX, got stylish in the gully as he raced to a win in the 18-and-under class with a time that would have placed him sixth in the pro field. 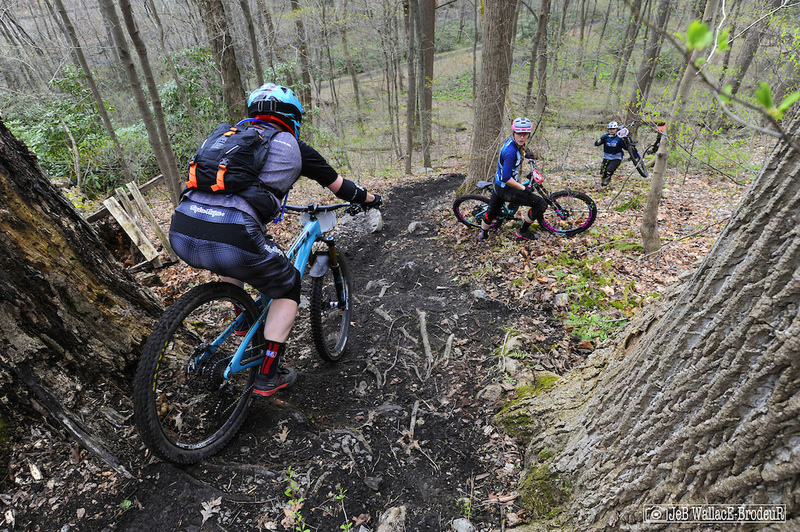 After a punchy climb, the segment alternated fast traverses with steep chutes before lining up a series of jumps. 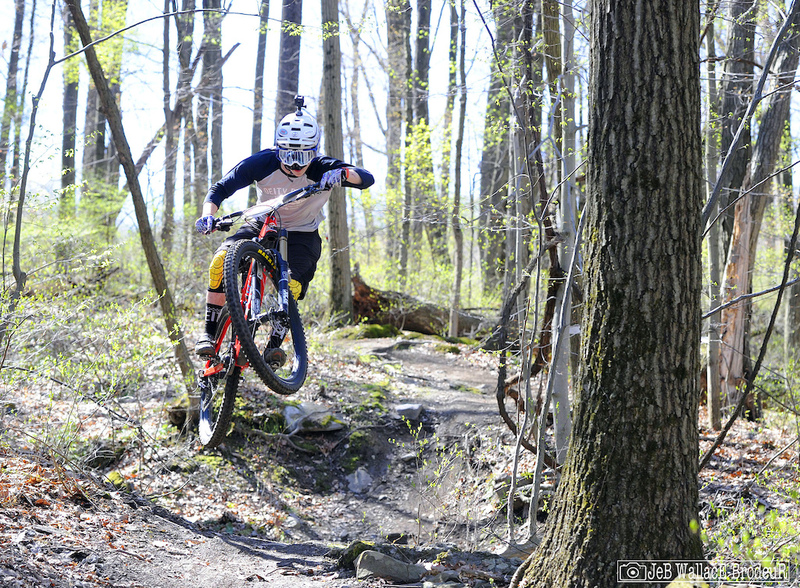 Caleb Griffin from Cape Cod caught the bike bug while working part time at his local bike shop and brought some youthful enthusiasm to his second-ever race start. One of the coolest looking features on the stage was a lippy kicker built into the base of a tree. Matthew Smith shaved some time by not skipping the feature as many did. Stage Three paralleled Stage Two at the top but quickly became a more challenging affair. A moss-covered battleship of rock offered a direct but riskier line as the trail pitched down the face of the mountain. 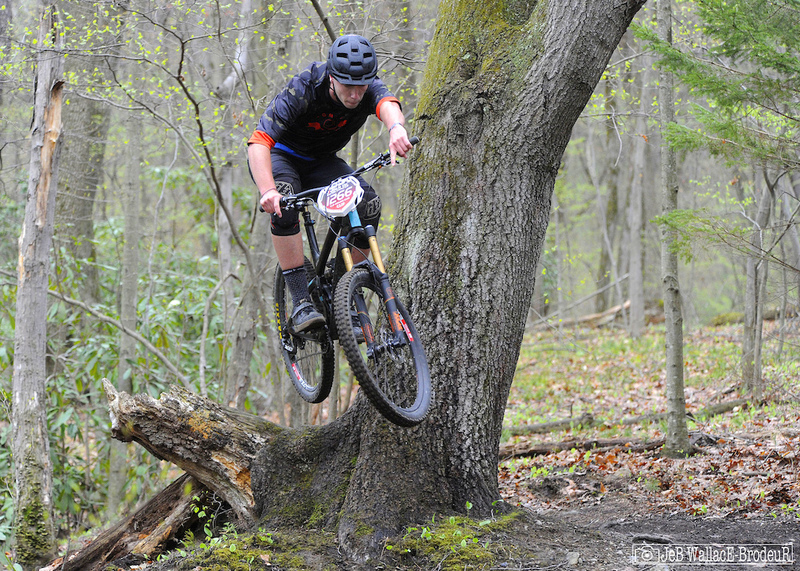 Junior racer Nathan Mizener, racing for Specialized Bicycles and Wamsley Cycles, didn't opt for the go-around. The middle of Stage Three had racers absolutely flying across the face of the mountain before offering a double and road gap to berm combo that required full commitment. 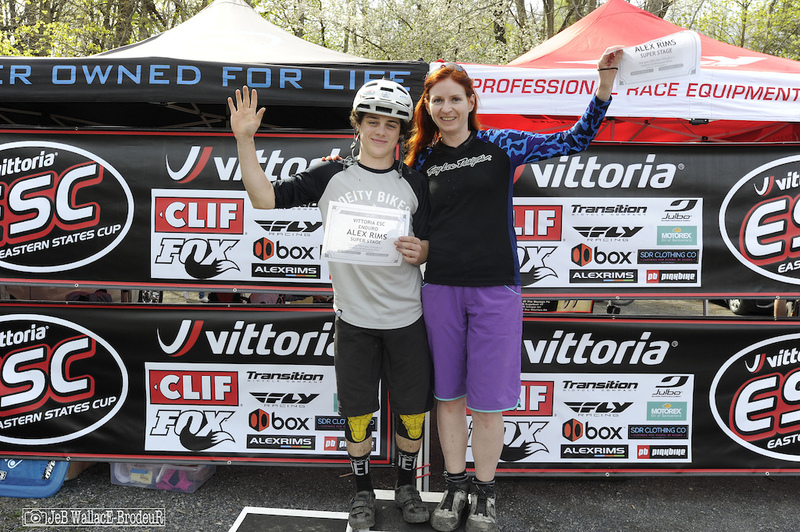 First-year Vermont pro Emmett Avery, riding for Chuck's Bikes and Julbo, sent the road gap but flatted lower on the stage to end his hopes for a top result. 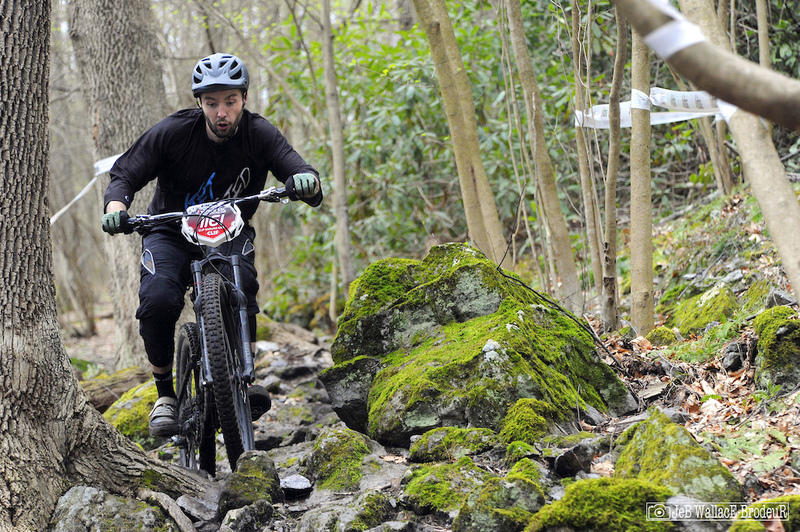 Fast and flat corners were a common theme throughout the enduro. Ben Smith, who makes the long drive to most Vittoria ESC enduros from his home Ontario, Canada, set up this corner on Stage Three perfectly. A steep, greasy chute near the base of the stage caused all sorts of trouble for racers, especially in the drizzle on practice day. 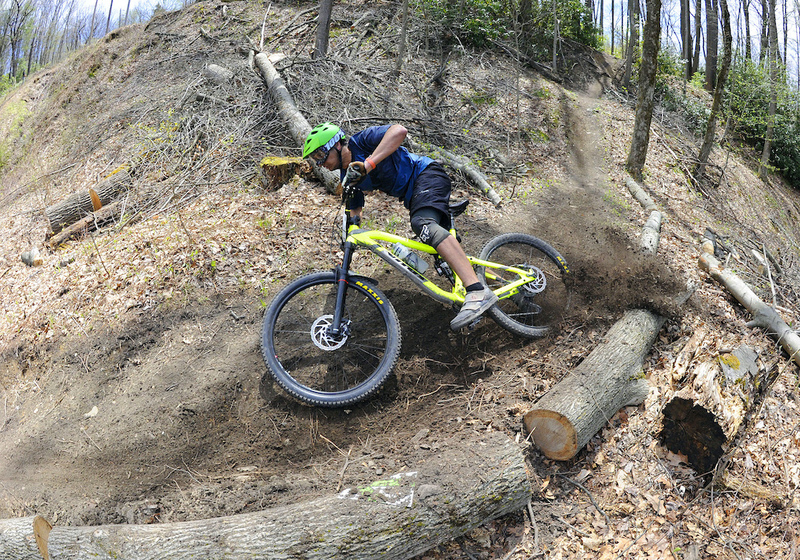 The slick roots and off-camber exit took down numerous riders. Stage Four took racers farther afield on the mountain, taking a sinuous line down the East shoulder. 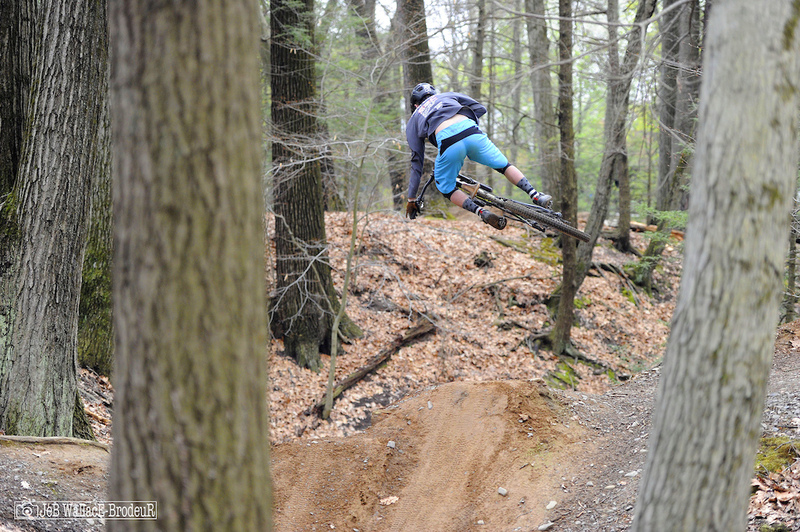 Stephen Matuzak from the A1 Cycling Gravity Team went with the flow through the remnants of last autumn's foliage. Much of the dirt at Glen Park is glorious with a fine loam and gravel mix creating a wealth of hero conditions. 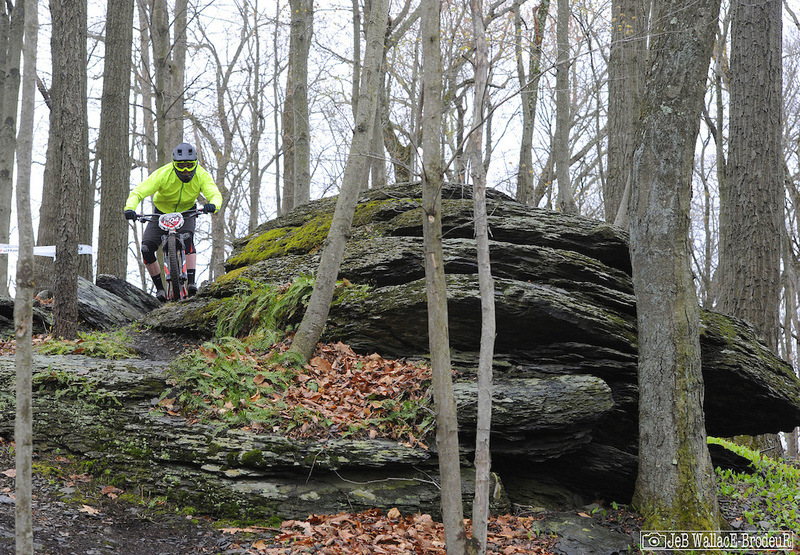 Near the bottom of Stage Four racers faced the only sustained rock garden on the course. The pucker factor at Glen Park was generally pretty low, which was fine with most racers who hadn't had much time in the saddle this season. 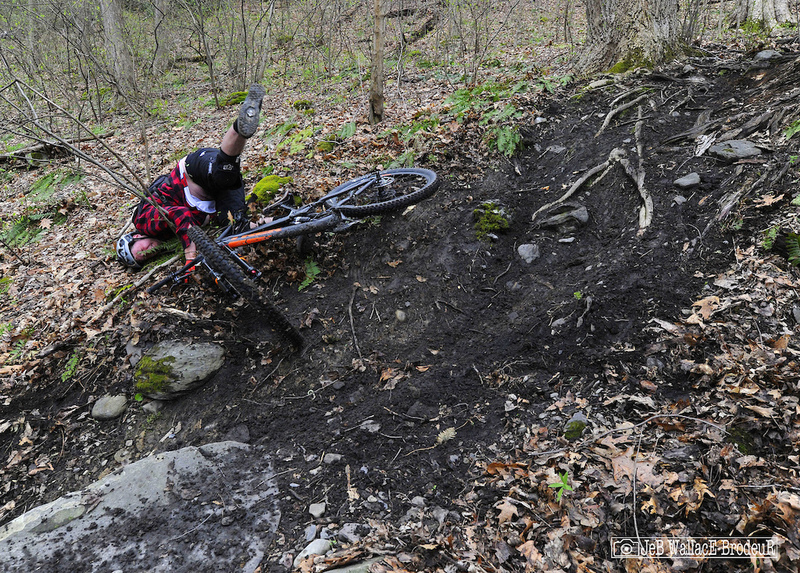 Forrest Kelly from Twisted Cog Racing and Stable 12 Brewing found the line through the mossy jumble. For the final stage, racers returned to the very top of the mountain. After a rip through the woods and a road crossing, riders took a high-speed staircase line over half-a-dozen perfectly-spaced drops that were an absolute blast. Chris Huffmire got some pop over a downed tree. After a flat pedal section, riders switchbacked through a series of loose corners beneath a power line. 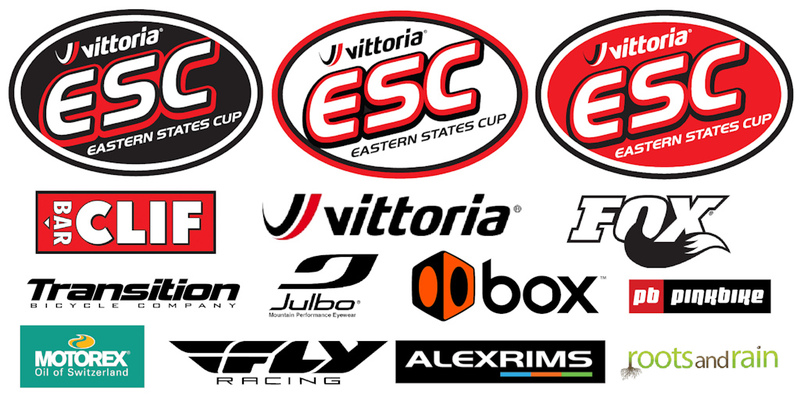 Joseph Tayabji got pretty loose in his first-ever Vittoria ESC start. Photo credit to Aidan Casner. 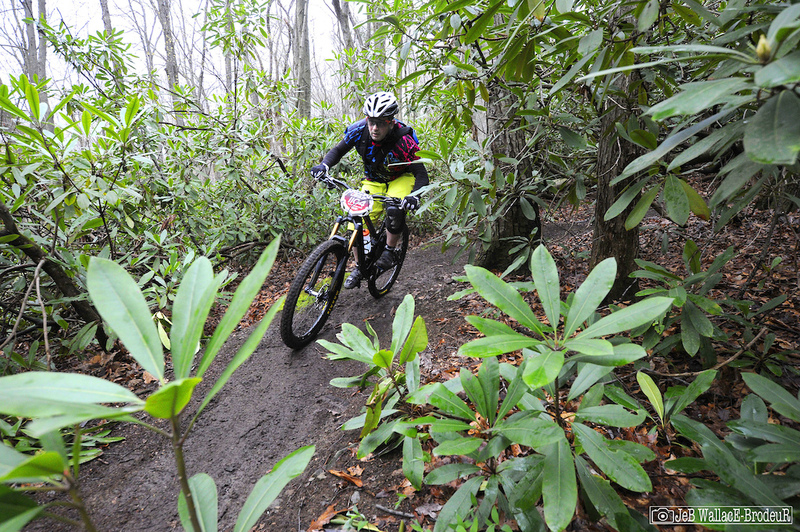 A high-speed double-track took racers through a rhododendron tunnel low on the stage. JRA Cycles pro Alison Crocker blasted down the final straightaway to the finish. After on and off showers all day Saturday, race day dawned crystal clear and promised perfect riding temperatures in the 60s and not a cloud in sight. A colorful crowd gathered for racer meeting on Sunday morning. 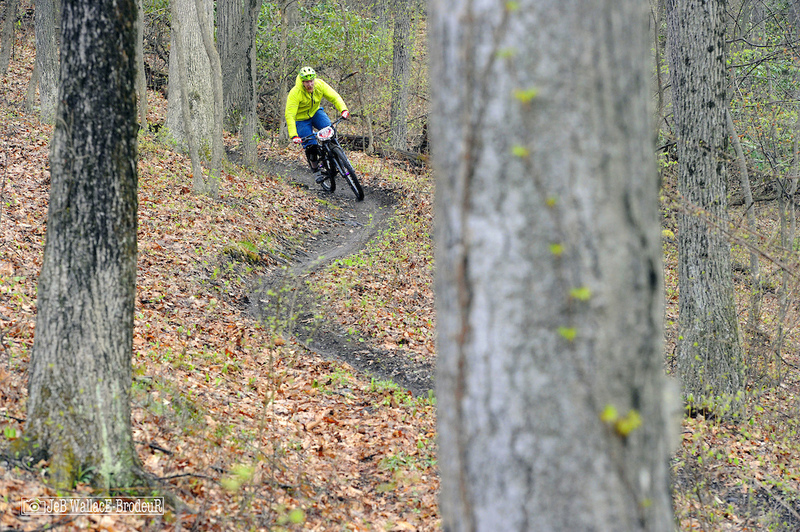 The Pocono Bike Club, who hosted the event, put on a great show. In addition to an army of volunteer course marshals and safety personnel, numerous local businesses stepped up to create a great experience for racers. The Arlington Diner provided a fully-stocked aid station near the top of the transfer climb. PBJ's, chips, bananas, nuts, water and sports drink mix from Ready Set Run were part of a welcome refueling and socializing oasis and not something we see at other races. Additionally, Cycle Masters Bike Shop provided neutral support and Siamsa Irish Pub brought a gigantic pot of delicious chili to the finish area for a post-race fill-up. 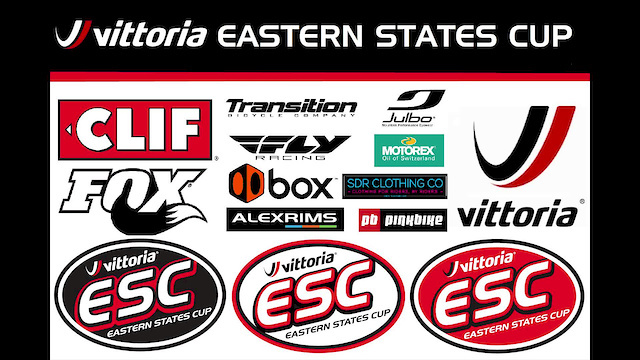 Its a common misconception that the Vittoria ESC races are just a burden on the host club's trail system. 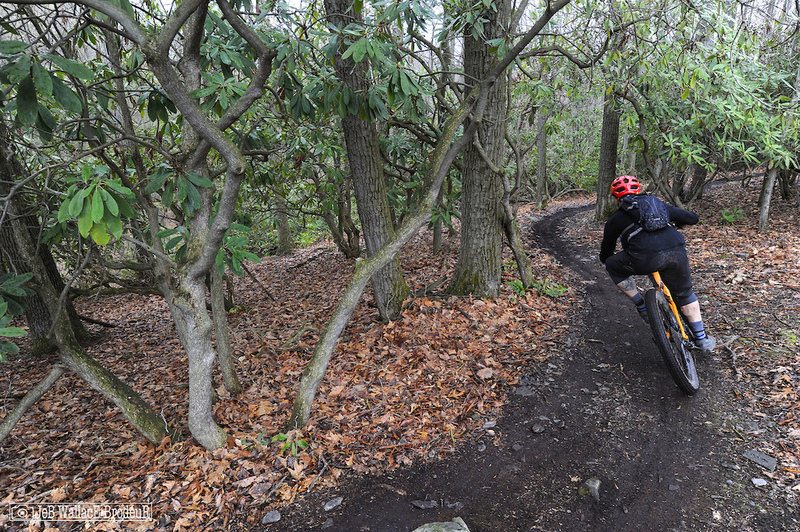 In truth the proceeds from the events go to the host clubs and are put to good use to improve and maintain the excellent trail systems like those built by the Pocono Bike Club at Glen Park. The Fox Transit Seatpost Climber's Challenge is back this season with the fastest climber in each class winning some Fox swag and the fastest overall amateur winning a new Fox Transit seatpost. 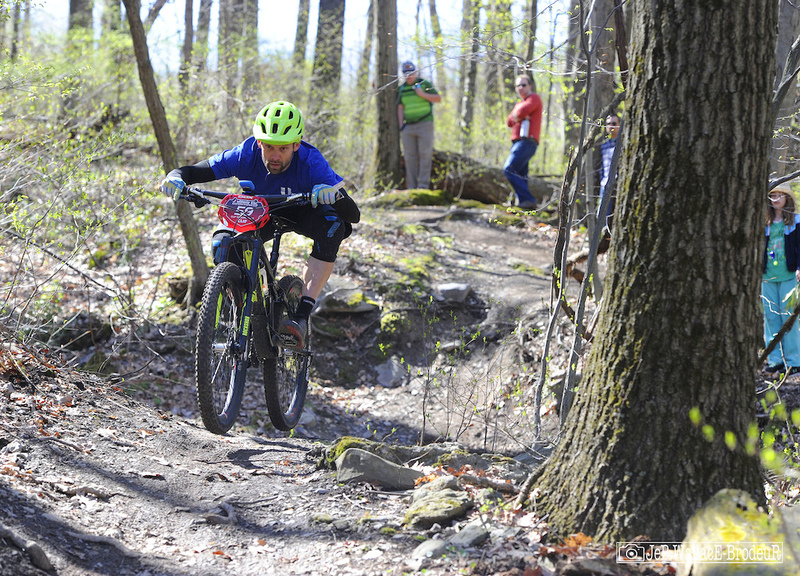 William Evers, from Twisted Cog Racing and Stable 12 Brewing, was the first man on the climb and no one would catch him as he took home the big prize. 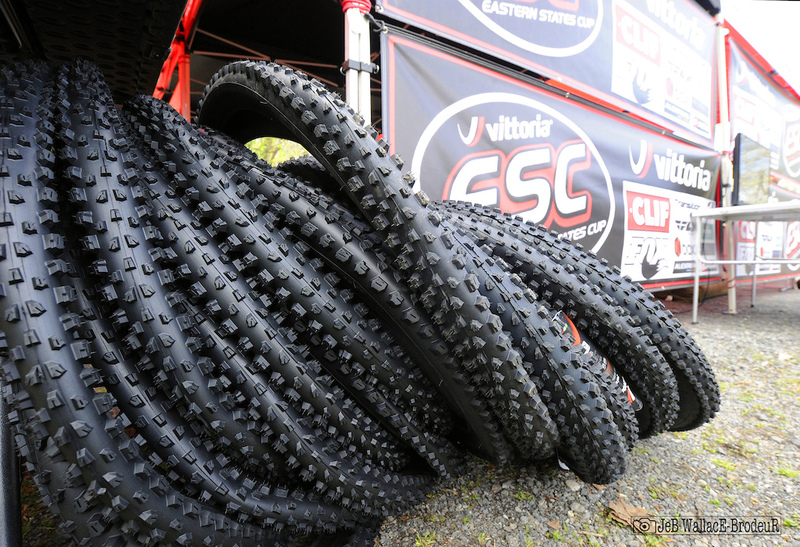 The prize table was loaded with swag, including an impressive pile of new tires from title sponsor Vittoria. New this season is the Alex Rims Stage Race which awards a set of Alex Rims to the fastest amateur racer on a designated stage, in this case Stage Five. Winners of the new rims were Max Beaupre and Lindsey Harris. The class winners in the Fox Transit Seatpost Climber's Challenge. 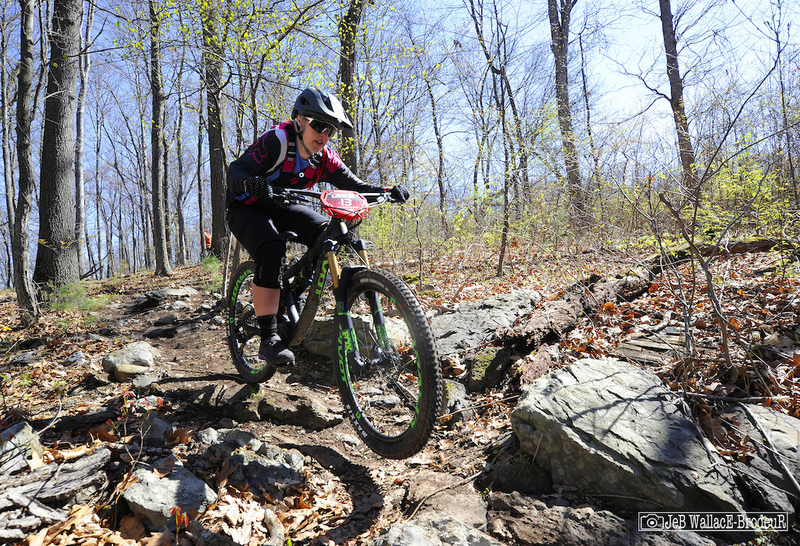 In the women's pro race, perennial powerhouse Lauren Petersen, riding for CFM Cycles, Fox New England and Pivot, picked up right where she left off last season. Petersen finished first or second in eight out of nine enduros last season and is rocking a new ride this year, moving from Intense to Pivot. Petersen took every stage but the first and ended with a 19-second overall advantage. 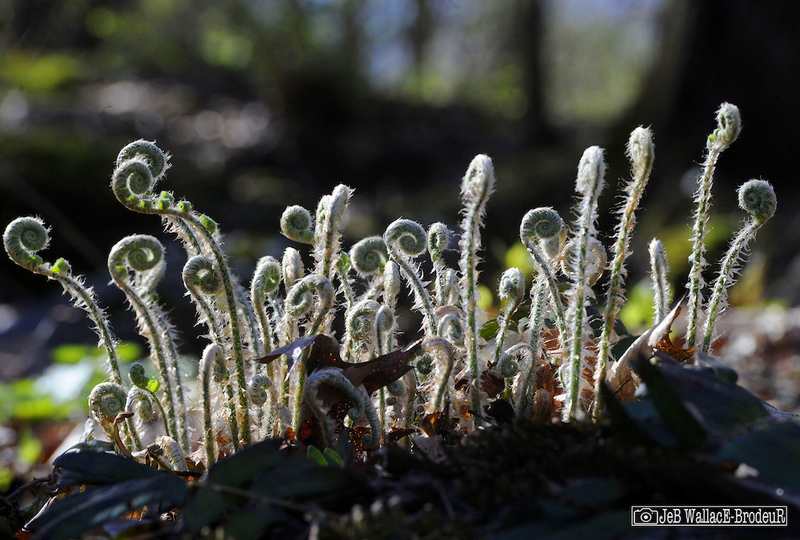 "I really enjoyed the course at Glen Park. It was my first time there but it reminded me a lot of the local stuff we have here in Connecticut. It was pretty straight forward, with little tech, so times were tight. But it made for more exciting racing that way! It was also great to catch up with all the girls and see some new faces in the pro field." Petersen struggled with some back issues in the off-season but says she is almost back to 100% now. "I think the time off the bike to heal up was good for me and clearing out the shed for some Pivots really helped inspire me to work hard in preparation for race #1. I'm grateful to Pivot for helping me out. The Mach 6 is hands down the most amazing bike I've ever ridden! 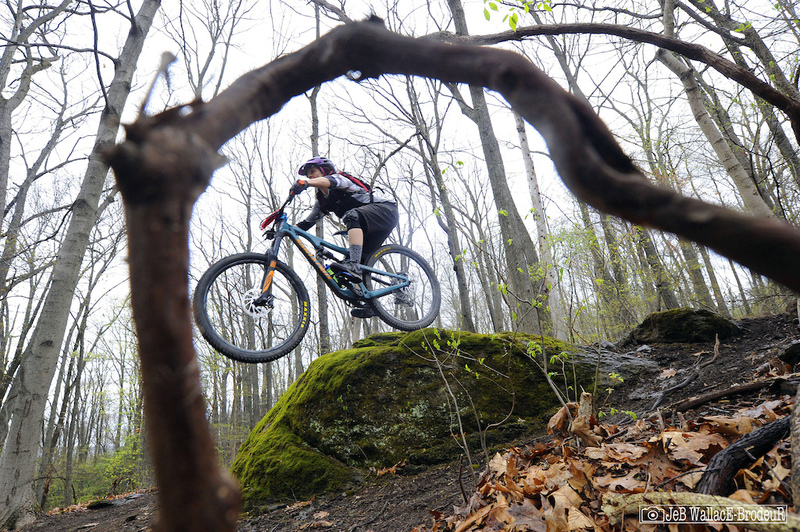 I am looking forward to Victory Hill and hoping for some drier conditions this time around." In the runner-up spot was Alisha Darin, also racing for CFM Cycles. 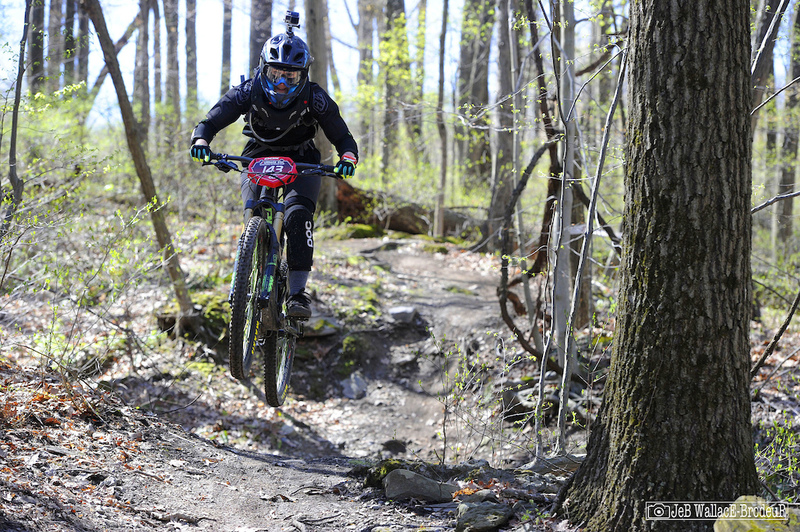 After winning six consecutive starts as an amateur last season this was Darin's first enduro race as a pro. Her consistency carried the day with no big mistakes and top-four results on every stage. Darin will clearly be a racer to watch this season. On the third step was Corinne Prevot, racing for POC, Skida and Kitsbow. Prevot was the only racer beside Petersen to take a stage win and after a small hiccup on Stage Three finished a scant two seconds behind Darin. The racing at the top of the women's pro field was super tight with a mere 24 seconds separating the top four finishers. 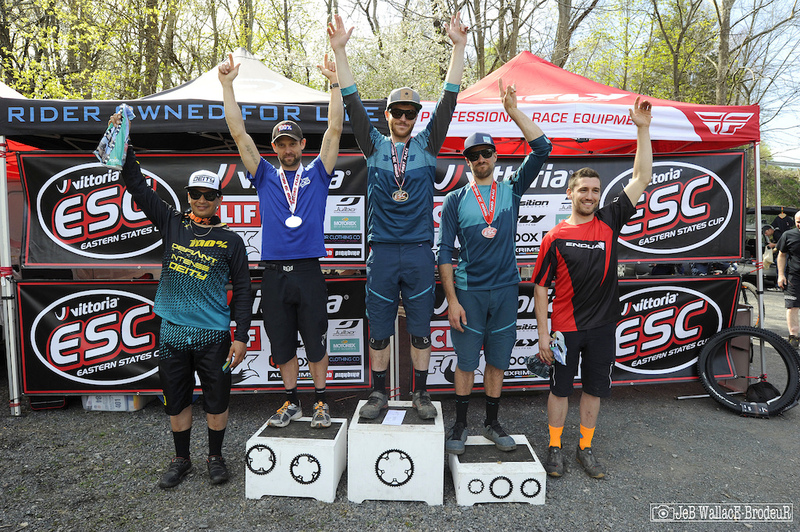 The men's pro field was dominated by Vittoria Tires pro Adam Morse, racing for Box Components, POC, TRP, and Yeti, who took four of five stages. Since transitioning from downhill to enduro last year, Morse has been on fire, winning three of his last four starts. "I thought the race venue was great. Every stage was packed with rad little bits and even trails that were not part of the enduro were catching my eye on the climb up. After a couple practice runs I got into a groove where I was having so much fun on the bike and the trails that I just didn't want to stop riding. That energy carried through to Sunday and kept me charged up for each stage." In second place was Jon Gabor, nine seconds behind Morse. Gabor has been racing for a quarter century and runs his own coaching, training, and fitness business. Despite a limited race schedule, Gabor clearly has what it takes to run with the best. 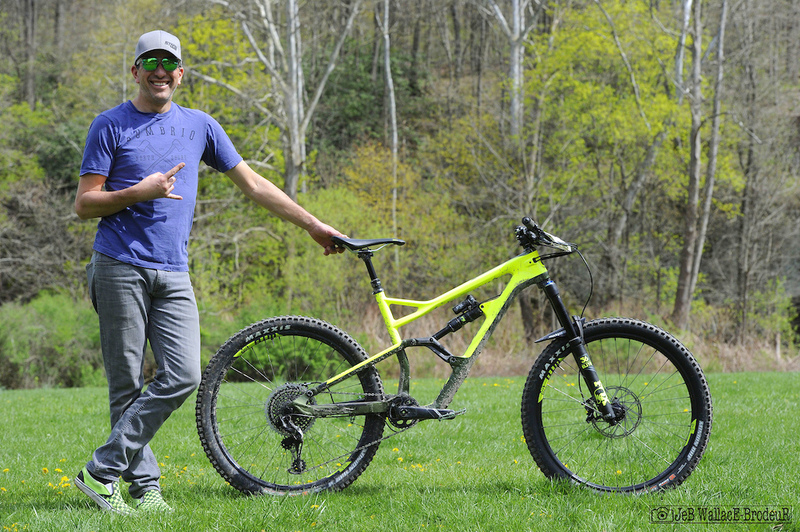 Yeti Cycles pro Jason Memmelaar, also representing Fox, FiveTen and Smith, is one of the most consistently excellent racers on the East coast and again proved his mettle by taking the third spot on the podium, just six seconds off second. It was a promising start to the 2017 season and all indicators point to a spectacular season of racing over the coming months. 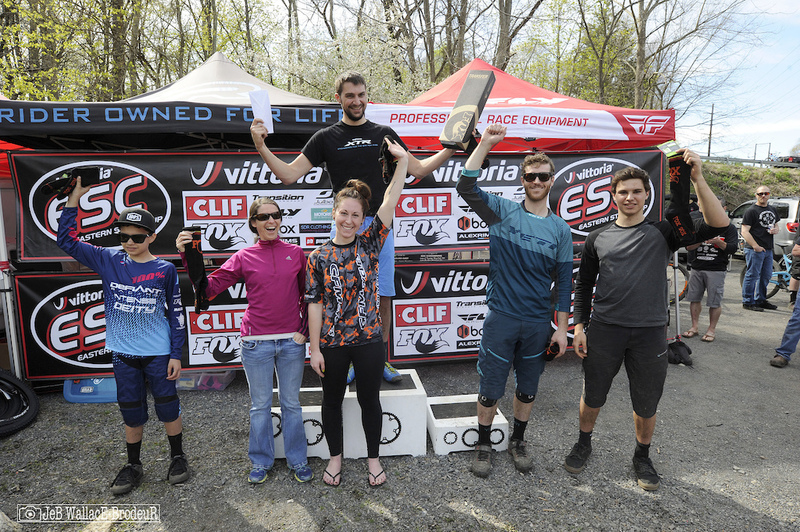 The next event on the Vittoria ESC calendar is just a month away with the Victory Hill Enduro in Vermont's Northeast Kingdom on May 21. 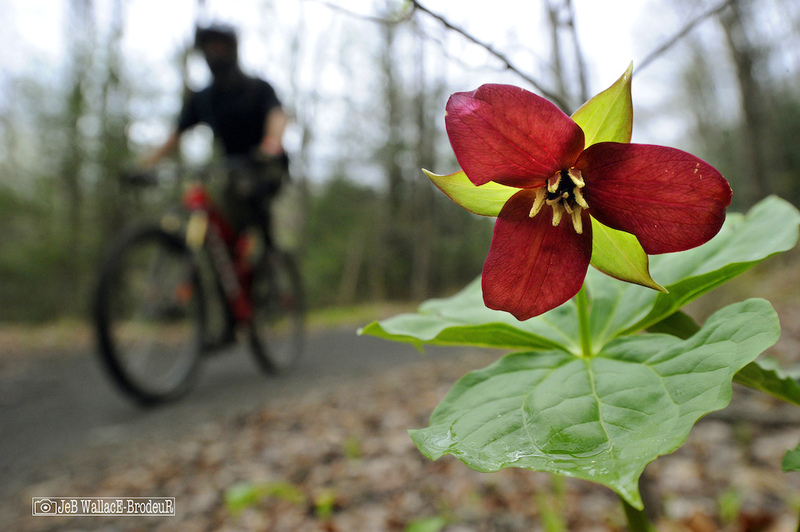 This is the only other pedal-only transfer race on the schedule so get on your bike and start logging some miles. See you soon! 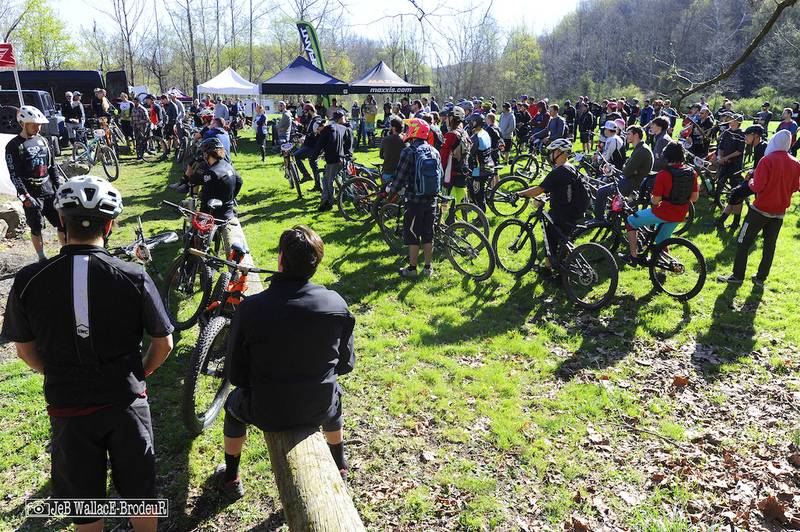 As you've probably heard, the Eastern States Cup has also launched a trio of new big money enduro events, all of the CLIF Enduro East are Enduro World Series qualifiers. 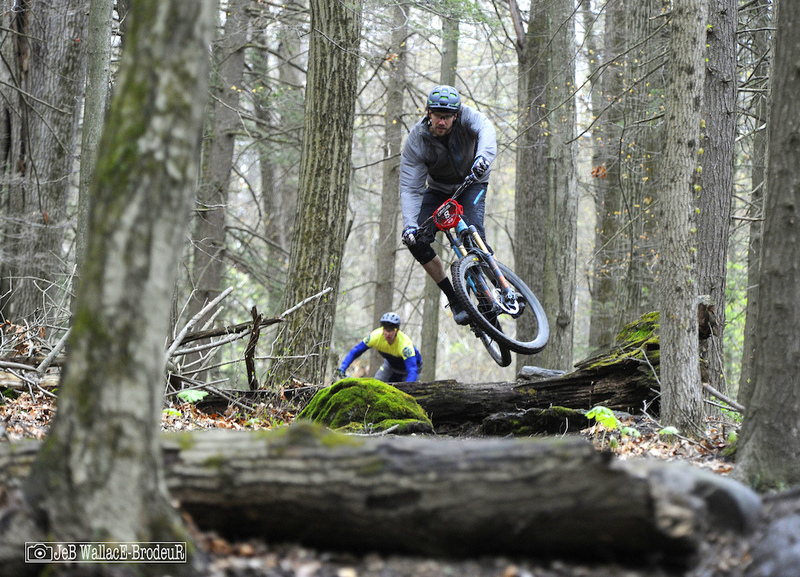 While the Killington/Green Mountain Enduro is part of the IMBA National Enduro Series. 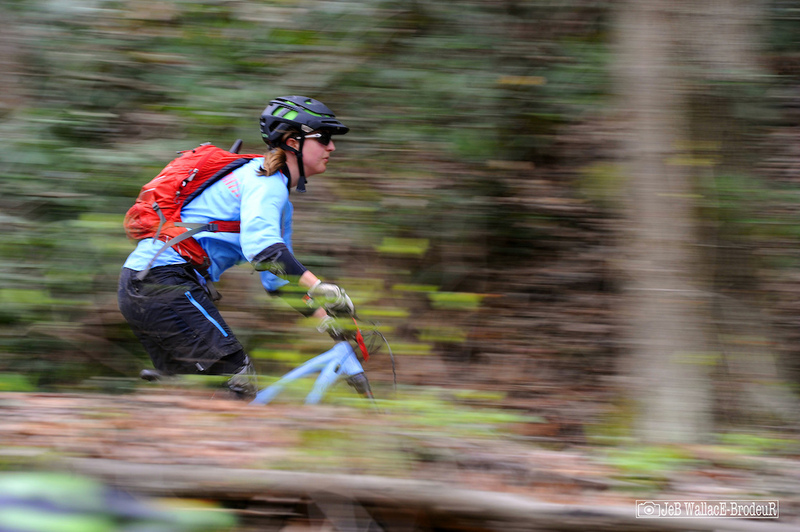 The photography is some of the best ever really captures not only the riding, but the great outdoors as well. Such a fun race at some of the most fun trails around! 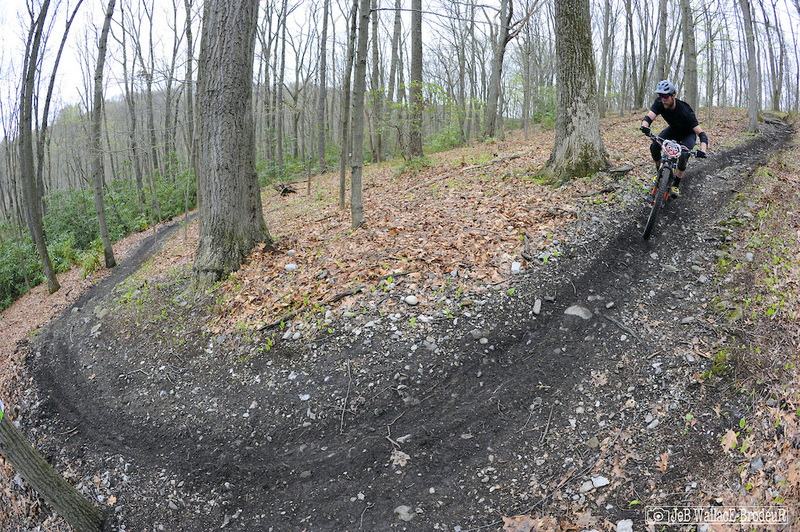 I love the more natural terrain over bike park races every time. See everyone up there again in 2 weeks! @noheavennohell: What routine would this be? I have never seen it malfunction. I don't recall any timing issue ever since 2013 except a broken chip once that was completely out of the ordinary. @JKSR: Pretty sure that Benji Klimas had a broken chip at this race actually. The system did work flawlessly this past weekend. Probably impossible to use for years without a glitch occasionally though. What technology doesn't fail occasionally? What other systems are out there? Other then what they use for EWS, and that would probably be to costly. 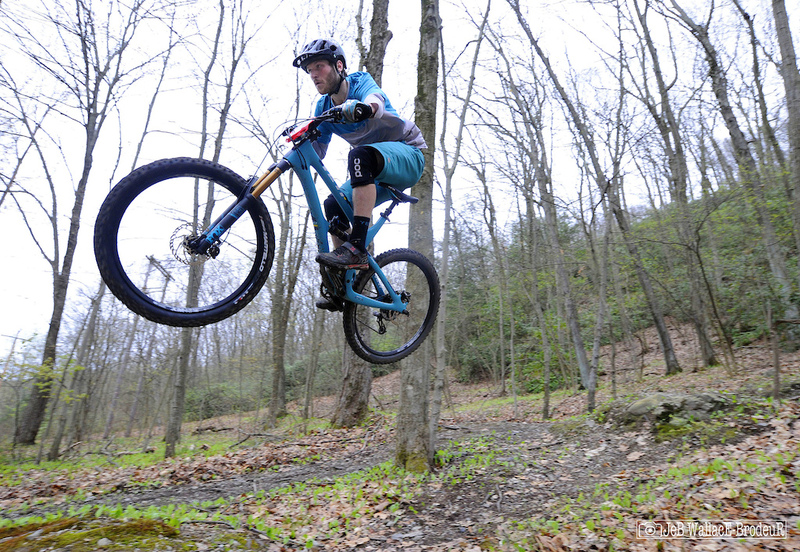 @moutnbiker: WVES uses the exact same EWS flyby system, and they charge less for their races. It's not too costly. 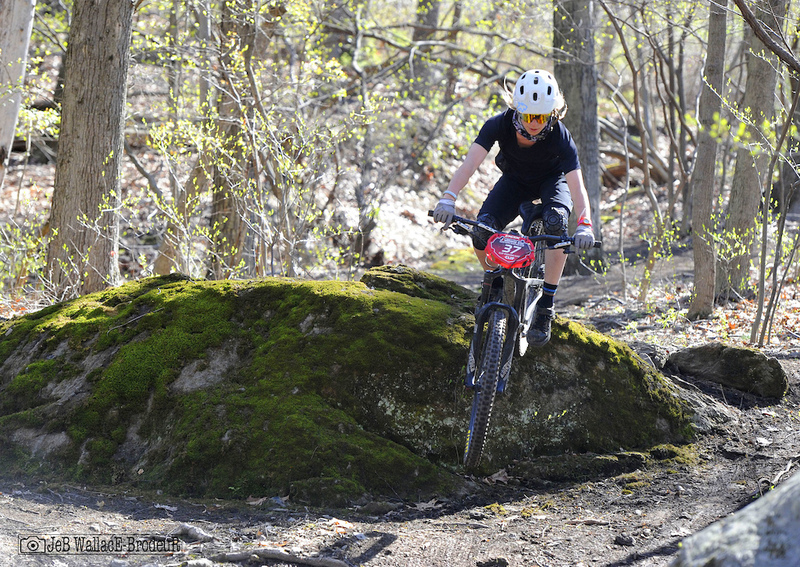 @RideAllamuchy: A friend who raced his first ESC race ever at Glen Park last weekend had a chip that refused to register at the end of stages multiple times. He lost a minute+ due to it, and after reporting it to a ESC official, they replied that "Some chips are more finicky than others." I've had this same thing happen with the chip system at ESC and other races, and so have multiple people I ride and race with. For a series as well-attended as ESC, they should not be using this system anymore. Did you see the picture of the dude in a plaid shirt on the trek that face planted? Yeah, that was me ???????? What an awesome event on an awesome course. 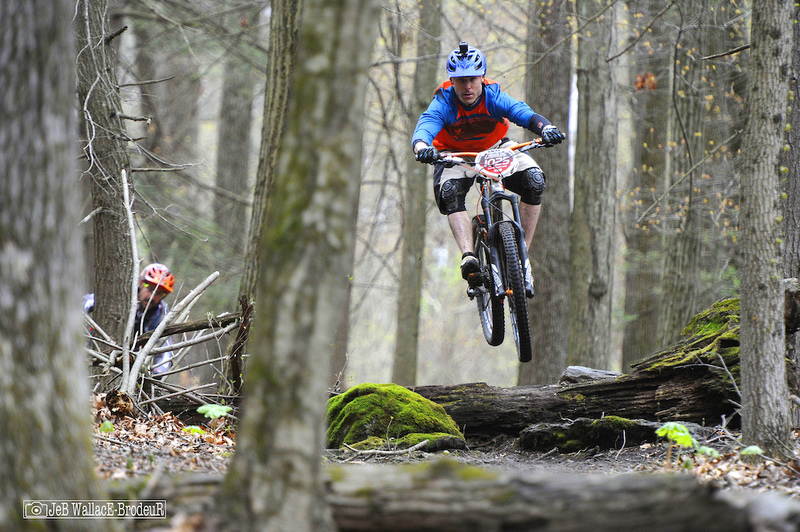 Thanks to the ESC crew and Pocono Bike Club for putting on a great race. That was such a great race!! The venue was amazing. I could do without so much climbing, my legs were DESTROYED!!! But ya gotta earn it to burn it, and that we did! But Hey, I finally made a PB write up SWEET!! Dude, you need that 42t in the back man! @WhiteroomGuardian: you ain't kidding, Ive been pricing out an xt set, Like 220 bucks. I cant use the One up components step up, its only for 36 tooth cassettes. ive been riding with that for so long, I didn't think it would make that much of a difference, guess I was WRONG! Great event! 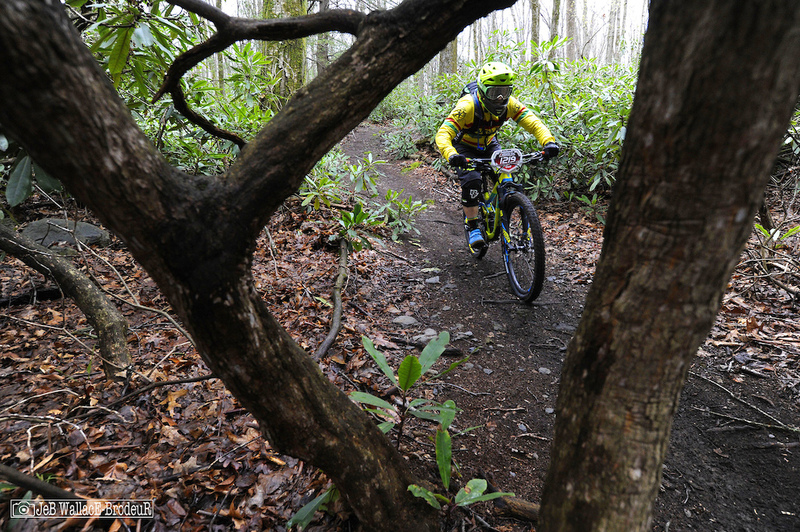 Can't wait for the Mid Atlantic Super Series Enduro at the same venue in two weeks. I hope to correct my mistakes on stage one and take a podium spot. Will it be the same exact stages? @scottay2hottay: I'm co-organizer Dan Brodeen, they will be the same. Race looks great! Chip system could be a little better right? Congrats John and Max!! Quite the father/son showing. Thanks Sarge, it was a great weekend of racing for sure. such a sick opening season race! Damn I should have just skipped my finals and raced! "Fox Transit Seatpost" Is that the one you use on the bus? 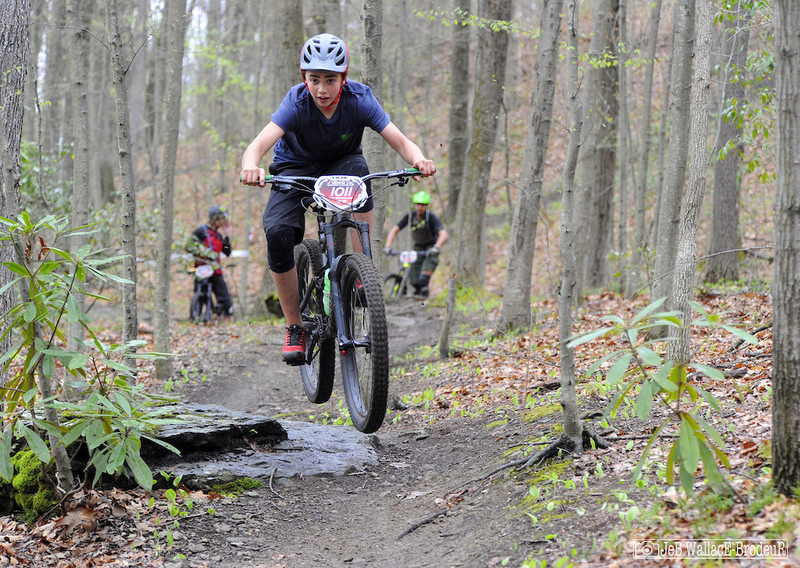 Thanks to the ESC and the Pocono Bike Club for a great event! Great race! Thanks to everyone that helps put these on !